*picture above is right before it went into the oven! When I think of summer foods, my mind goes to fruit! Specifically, pineapple! Who doesn’t love this awesome fruit? So versatile, too! In a salad, as a dessert, on the grill with something savory! 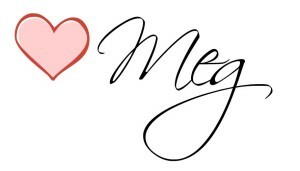 You can’t go wrong! 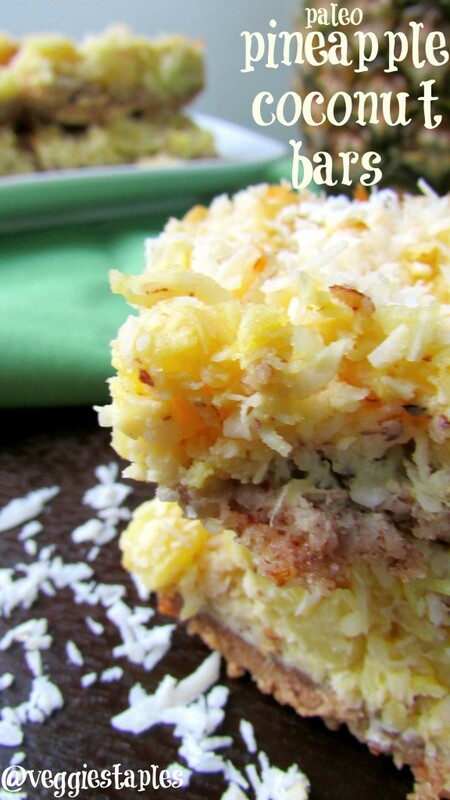 These (paleo/gluten free/grain free) pineapple coconut bars are a perfect summer treat. 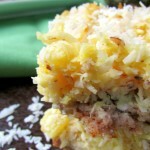 Really easy to make, and the flavor reminds me of a pina colada! Although I made these and had all of my family do the taste testing, these would be the most marvelous ending to a summer BBQ. What do you think? Bake for 20-25 minutes, until edges are golden. 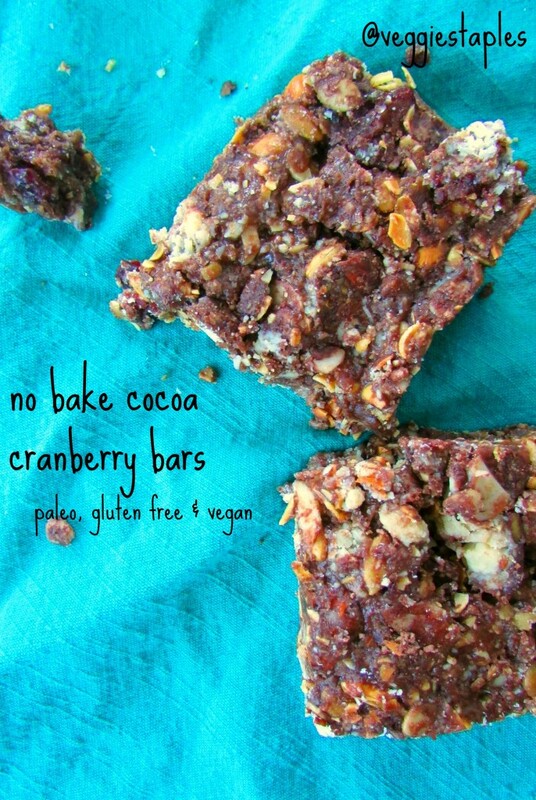 I’m reallyyyyyy into these no bake cocoa cranberry bars right now. I normally really dislike dried fruit, but with the cashew butter in these no bake bars, and the cocoa, they really are just delicious. I find myself craving them in the afternoons or in the evening after dinner! I don’t have to feel guilty about eating them; no refined sugars, full of protein & fiber, so they are very satisfying. And did I mention they are no bake? 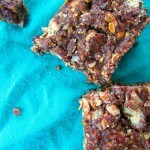 (if you like no bake bars, check out the other no bake bar I just posted)! I’m finding that cocoa & cranberry is my new favorite combo! What is your favorite combination in any type of snack bar? Last weekend my mom and I entered two recipes into a local Apple Contest. My apple bars won 3rd place! Can you believe it? 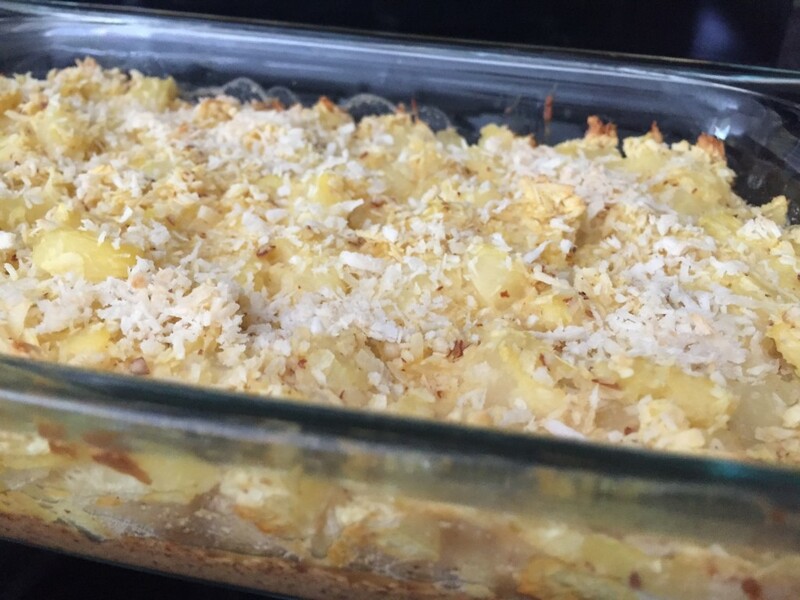 I’ve never entered a recipe contest before, and I won third place! My Mom also made a pork and apple pot pie that won third place in her category and Best in Show! (she was in the savory category, I was in the desserts category). Pretty awesome day for the Sellner girls. (I am working on a gluten free and vegan pot pie recipe now). 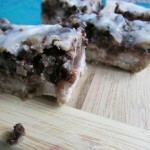 These apple bars are a take on the classic “Magic Bar” or “Seven Layer Bar”. They are super decadent (so they certainly are a treat) but everyone swooned over them at work and when samples were handed out at the contest. I will definitely be making these for other parties and events! Is there a go-to dessert you always make that know will go over well with a crowd? 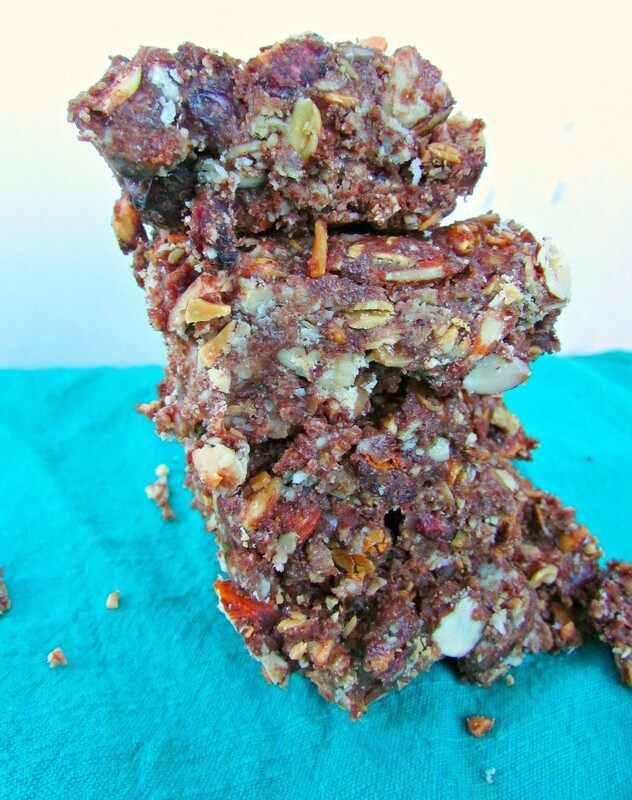 AND, these are paleo and vegan caramel apple bars, twice as appealing to everyone! 1. Begin by pouring the entire can of coconut milk into a pan. Bring to a bubble (but not boil) and slowly add in 1/4 cup of honey. Lower heat and stir occassionally for thickening. To make the ‘condensed milk’ the coconut milk must simmer to reduce and thicken for 30 to 45 minutes. 3. While the coconut milk is thickening, in a food processor, buzz almonds/almond flour, 2 tablespoons molasses, 1 tablespoon arrowroot powder, 1/8 teaspoon salt until dough forms. This is the mixture for the graham crackers. 4. Take the dough out of the food processor and place dough between two pieces of parchment paper. Roll the dough out with a rolling pin until it is 1/4 – 1/2 inch thick. 5. Remove top parchment paper sheet and place the dough on a cookie sheet. 6. Bake the graham crackers in the oven at 350 degrees for 7 minutes. 7. While the graham crackers are baking and coconut milk is thickening, begin the caramel mixture. Start by melting 3 tablespoons of coconut oil on medium heat in a sauce pan. 8. Add milk and stir with a whisk. 10. Remove caramel mixture from heat and while stirring, slowly add in 1/4 cup of honey. 11. Place caramel sauce aside and allow caramel sauce to cool. 12. Remove graham crackers from oven and allow to cool (if they have not yet come out of the oven already). 13. Wash, peel and slice apples. 14. Remove graham crackers from parchment paper and place in the food processor or blender and buzz until crumbly. 15. Melt 1/4 cup of coconut oil (I put it in the microwave for a minute in a bowl) and combine with crumbled graham crackers for graham cracker mixture. 16. Grease pan with coconut oil as needed (I used a 9 X 9 inch pan). 17. Press graham cracker mixture in the bottom of the greased pan and pack tightly. 18. Layer apples in rows on top of the graham crackers. Sprinkle with 1/2 teaspoon (or more) of cinnamon. 19. Divide the coconut milk mixture in half and evenly drizzle half over the apples (the other half will be for the top layer). 20. Drizzle caramel sauce evenly across the top of the coconut milk mixture. 21. Add the next layer of chocolate chips spreading evenly on top of the caramel sauce. 22. Drizzle the rest of the coconut milk mixture on top of the chocolate chips. 23. Bake for 25 minutes at 350 degrees. 24. optional: best when served chilled. (Place in the refrigerator for a few hours until cold).